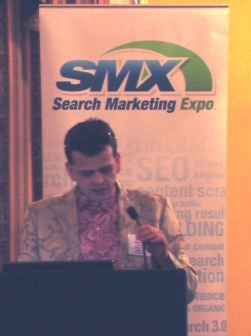 SMX London day 2 has started with a super interesting session on link building strategies. I was surprised to really hear NEW stuff and much more than the regular “submit to Yahoo!” and “get links from your business partners, clients and vendors” – The speakers seemed all very knowledgeable and experienced in what I find is the most important quality in link building: Think OUT of the box. In order to get high quality links massively and ongoing basis we must ‘re-invent” our selves, our product and offering in order to create enough interest with other bloggers and web site editors to link to us, naturally and favorably. Some ideas were around leverage seasonality with events such as quarterly reports for public companies, new CEO’s, new product launches etc. Another idea was getting .edu links by finding .edu sites maintained by students and some other cute ideas. Lead by Vanessa Fox, this session deals with larger scale dynamic UGC websites. Nathan Buggia discussed general strategy of what web sites in the 2.0 era should offer, Tom Critchlow of Distilled discussed aspects of internal linking and enabling external linking more easily using nice examples from last.fm and youtube. Dave Naylor is talking about his experience with UGC and the limitations of control vs. moderation vs. anarchy and their impolications on business and on SEO specifically. Later on David added that Yahoo! is cloaking their external links from their various products with tracking links, in a debate on how to best deal with AJX and content which needs to be scuplted. Mikkel deMib (amazing colorful suite, as always) is discussing the web 2.0 issues such as use of AJAX and interactions which may be problematic with SEO. Mikkel describes issues with using AJAX such as using the “#” sign to mask script URL’s and discusses the questions need to be asked when implementing AJAX solutions on web 2.0 web site. One very nice example is actually the opposite where Mikkel recommend using AJAX to sculpt links. For example if you do not want too many links out from your homepage you can sculpt your links to sub-categories via AJAX thus to maintain your pagerank flow managed. Next, Mikkel discussed UGC concepts. For instance, Mikkel describes that you may not need keyword research because people write similarly to how they search 🙂 Now this theory needs to be checked but it does make some sense you must admit. Teach your users to get 1 link to their content. one 1 link for each content piece may mean thousands and thousands of new links every month. That’s it for now… will keep updating after lunch.